Custom make is like going to the doctor; the doctor deals with you only until the objective is complete. You and your doctor have your relationship; you feel special and he ensures that all his attention is on you while you are dealing with the challenge at hand until he is done and then you pay him. This process could cost more than going to a clinic and dealing with a nurse; and is maybe more accurate in its solution to your problem. In the same way, the designer will meet 90% of all the clients. Retail/bulk production is more like going to a clinic; standing in the blood pressure line waiting to have your blood pressure taken for a small fee. You walk in, sit, have your blood pressure taken and the findings written down and handed to you. If you ask a question about it; normally you will be advised to see a doctor. If the line is too long and you haven’t made it in to the nurse’s room by closing time, you have to come back tomorrow. In this instance, there isn’t a critical project at hand; if there is they will again refer you to a doctor. The designer will meet maybe 2 % of all the clients. 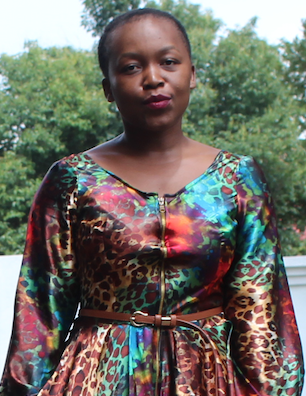 I started my career in retail; working for a huge fashion retailer in Johannesburg, South Africa. It was the best starting point. Our jobs in the fashion buying and planning teams were to ensure the right stock was in stores at the right time, at the right price. Then make sure it didn’t run out or pile up. We could tell you that our Nelspruit store, for example, was doing well, but could not tell you who was buying what. In custom make I can tell you who bought what, for how much and when; and also describe each client’s taste to detail. In custom make, there could be 3 prices for the same item depending on what the client wants. This is because, there are many ways to make any item. I offer all these ways to my clients. Something like a tulle skirt could be R600, R700, R800 or even R2000 each based on what we are attempting to achieve. Also, this works in the clients favour for items where we are working with expensive fabrics; we need to only buy what we need; literally 1,25m of a lace at R2 000 a meter. I always advise people to not copy an item; rather say I love this, and then we see what can we do that is similar or inspired by this item. You could pay more or less. In retail, there is one style, one price. This makes them more affordable across the entire production line because we are negotiating a price for a lot of fabric at a time. Here you have less playroom; whatever you are putting in stores needs to be commercial enough to be wanted by more people; cover a comprehensive size curve, and that size curve must be representative of your target market; while keeping in mind some items look wrong and fit differently in specific sizes; they must be in store at the right time; and measure similarly in pricing to your competition in that area. Custom make doesn’t have a sizing chart at all. It’s one of the reasons it also costs more. Here we work with measurements to the T. The garment will be created to fit that client, on that day, and no one else. Most of us are different sizes at the shoulders, to the waist and to our hips. This is one of the biggest selling points for custom make; it is people, like me, who struggle to find clothes that fit them well in retail. I am passionate about fit. It’s such as important factor to a lot of us; to know that we can fit into what we want to wear and look good. In retail, one style in a standardized size chart. Whether it is S, M, L, XL or 32, 34, 36 and 38; that’s it. Here we are attempting to service a bigger group with one size curve. Very, very, very challenging. This is why a big retail store like Edgars has a Petite section; and once had a DonnaClare for the larger client. Both are there to serve all the people excluded by the ‘normal size curve’. Custom make and retail are both profitable; but come in different ways. On custom make you are making more profit per garment at a time; on retail the more you sell the more you profit. You will be making R1 or 1000 orders vs R1000 profit on 1 item in custom make. This is one of the reasons you cannot decide on one or the other based on money only; it has to be something you are passionate about, patient for and determined to achieve. In retail you also need to invest money as a fashion designer prior to making a cent. And it is a lot of money. You need money for the styles multiplied by the units on your size curve; labels for each, washing labels for each, size labels for each, labour to make each, courier and some sanity! All of this without any profit; then pray that your people will like your styles and want to buy them. Preferably, all of them! Most investors are not willing to fund this as, well where is the proof that this will sell…. In custom make; you can ask for a deposit or full payment prior to starting an order; so the client buys their own fabric to start and settles when the order is complete. This sound easier…until you grow. Eventually, you find yourself taking in deposits to buy that other ones fabric; the getting paid to purchase the next one. It becomes a wheel that needs you to keep working. Another reason this is not about cash only; it should be driven by something higher and more powerful. I personally love custom make; it provides more freedom; allows me space to experiment and have fun. I do have to deal with multiple personalities over time and it becomes taxing at some point; but I still choose it. Hence the retail store we are going into are still controlled; as in not too big and allows us to do ‘custom retail’. We are allowed to create only a specific number in each style, never to be repeated unless demand is high. The opportunity with both of these for us is if the retail side works and it balanced well; we will never have to wait for client’s deposits to start on orders; we will have reserves that allows production to continue. The retail will be our CORE and the custom make will be the FUN. But this all requires delicate management, meditation and perseverance. I hope I have shed some light on these two and assisted you to decide where you want to go with our business. Each of us are stronger in one of these areas; and not in the other. Knowing this will help you better understand where to put in more work. I myself will need a lot of patience with retail and pray to God to provide the much needed ‘prior’ investment.